Score after 20 overs, WI 124-9, Thomas 8(4), Brathwaite 15(19); Bumrah 4-0-20-2. 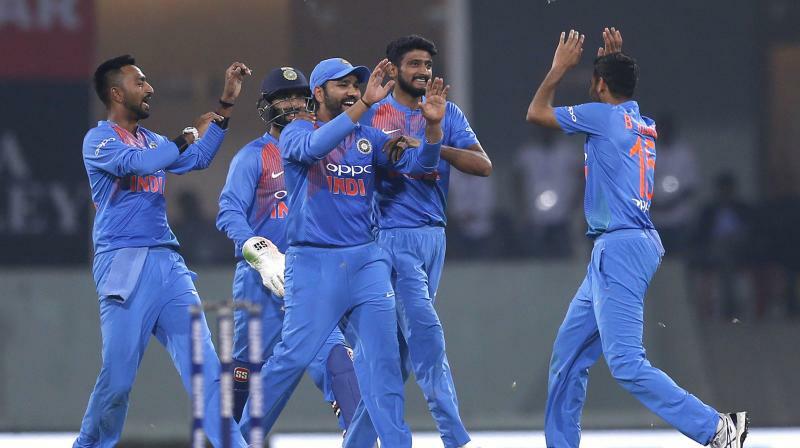 Lucknow: Rohit Sharma-led India clinched the T20I series against West Indies after a dominant win by 71 runs in the second match here on Tuesday. The series is now 2-0 with one match left to play. West Indies never looked comfortable and settled throughout their innings and kept losing wickets at regular intervals. After Khaleel Ahmed got rid of Shai Hope (6) and Shimron Hetmyer (15), Kuldeep Yadav picked up two wickets in the eighth over to see off Darren Bravo (23) and Nicholas Pooran (4). All four bowlers, including Kuldeep Yadav and Khaleel Ahmed finished with four wickets each. WICKET! Kuldeep Yadav gets his second victim in the same over as Nicholas Pooran is clean bowled. WICKET! Kuldeep Yadav joins the party as he sees off Darren Bravo courtesy a Rohit Sharma catch. WICKET! Khaleel Ahmed does the damage once again, this time Dhawan takes a catch at long-on to dismiss Shimron Hetmyer. Rohit Sharma (111 not out) top-scored as he led hosts India to a challenging total of 195-2 in the second T20I against West Indies here on Tuesday. The stand-in captain's latest ton was his fourth in the shortest format for India. Rohit and Shikhar Dhawan started on a very strong note, with the duo putting up a 123-run stand before Dhawan was dismissed for 43 by Fabian Allen. Rishabh Pant came in next, and even his stay was short-lived as he was seen off by Khary Pierre for five runs. However, KL Rahul supported the skipper well from the other end, having scored 26 runs off 14 balls. Rohit also became the first player to slam two T20I tons as captain of the national side. CENTURY! Fourth T20I hundred for 'Hitman' Rohit Sharma. WICKET! Rishabh Pant is dismissed for five runs by Khary Pierre as the hosts lose another wicket. WICKET! Shikhar Dhawan is dismissed by Fabian Allen for 43 runs as Nicholas Pooran completes a catch. FIFTY! Rohit Sharma brings up his 16th fifty in T20 internationals. Not only the fifty has come for Team India, but also Shikhar Dhawan has crossed the 1000-run mark in T20Is. Rohit Sharma, meanwhile, has become India's highest run-scorer in T20Is (2117 runs), going past Virat Kohli. West Indies have won the toss and they have put the hosts to bat. India have made one change, bringing back Bhuvneshwar Kumar in place of Umesh Yadav. International cricket will return to Lucknow’s Bharat Ratna Shri Atal Bihari Vajpayee International Cricket Stadium after 24 years on Tuesday when Rohit Sharma-led India take on Carlos Brathwaite’s West Indies in the second T20I. India lead the three-match series 1-0 and sealing the same will be their top priority. The hosts’ road to victory in the first match was not easy after the top-order, including Rohit and Dhawan, failed to produce big scores. However, it was a debut to remember for Krunal Pandya as he and Dinesh Karthik took the Men in Blue beyond the finish line with 13 balls to spare in Kolkata. The Windies, meanwhile, will have a lot of questions to be answered after they were bowled out for 109, and more importantly failing to defend that despite taking half of the hosts’ wickets. Captain Brathwaite, though, looked impressive in terms of his bowling, finishing his four-over spell by taking two wickets and conceding just 11 runs. India: Rohit Sharma (Captain), Shikhar Dhawan, KL Rahul, Dinesh Karthik, Manish Pandey, Shreyas Iyer, Rishabh Pant, Krunal Pandya, Washington Sundar, Yuzvendra Chahal, Kuldeep Yadav, Bhuvneshwar Kumar, Jasprit Bumrah, K Khaleel Ahmed, Umesh Yadav, Shahbaz Nadeem. West Indies: Carlos Brathwaite (Captain), Darren Bravo, Shimron Hetmyer, Shai Hope Obed McCoy, Keemo Paul, Khary Pierre, Kieron Pollard, Nicholas Pooran, Rovman Powell, Denesh Ramdin, Sherfane Rutherford, Oshane Thomas. The live streaming of the second India versus West Indies match will be available on Hotstar.com and Hotstar app. The live telecast of the match will available across various Star Sports channels.